Nick Giafis ’06 PhD, senior director of medical sciences at Pharmacyclics, discussed his career with graduate students and postdoctoral students during the event’s roundtable lunches. Graduate students and postdoctoral fellows in the biomedical field gathered last week for an all-day symposium dedicated to showcasing research and exploring careers in the biotech and pharmaceutical industries, as well as academia. 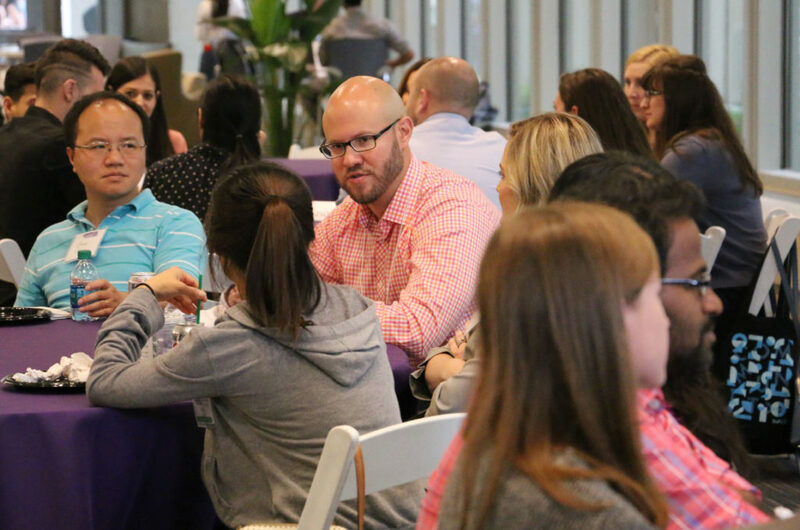 The event, “Current Research and Future Careers Symposium,” was co-hosted by the Northwestern University Postdoctoral Forum (NUPF), an organization dedicated to creating community among postdoctoral fellows, and Northwestern’s BioProfessionals career development program. “We wanted to ensure that all postdocs and graduate students at Northwestern understand that academia, though an excellent path, isn’t the only path, and that there is a diversity of intellectually challenging and fulfilling careers out there,” said Dean Procter, PhD, chair of NUPF and an organizer of the event, as well as a postdoctoral fellow in the laboratory of Derek Walsh, associate professor of Microbiology-Immunology. The symposium kicked off with two career panels dedicated to exploring both tracks. Breaking into Academia” featured discussions by Feinberg’s Richard McGee, Jr, PhD, associate dean for faculty recruitment and professional development, as well as Gabriela Caraveo Piso, PhD, and Christina Zelano, PhD, both assistant professors of Neurology, and Steven Graves, PhD, research assistant professor of Physiology. 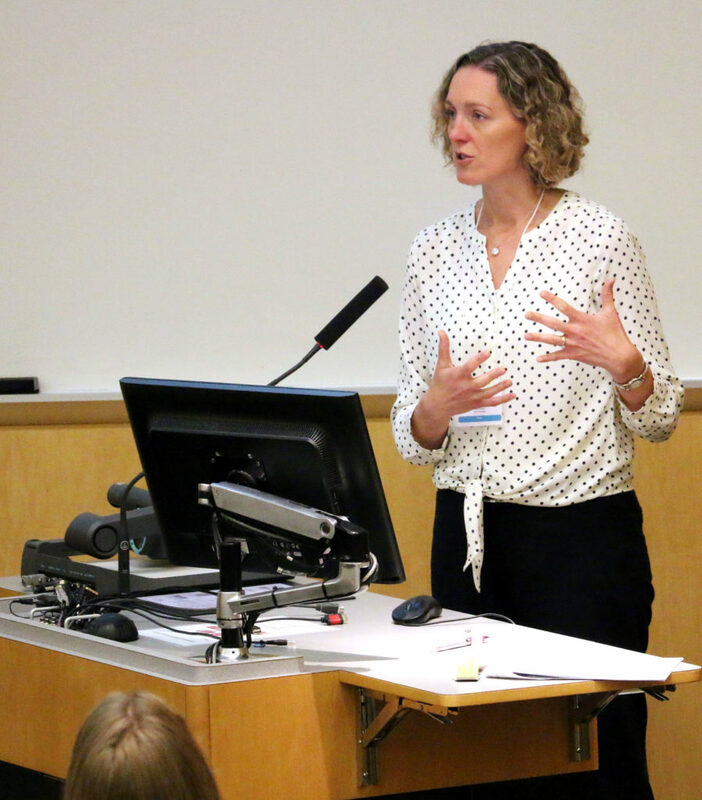 Meg Ruesch ’98, PhD, vice president at Pfizer, delivered the keynote address. A “Breaking into Biotech and Pharma” panel followed, where scientists and leaders at companies such as Pfizer, AbbVie and Genentech discussed their career trajectories and provided advice to attendees. The panelists also engaged with students and postdoctoral fellows directly in small groups during networking roundtable lunches. Wyatt also presented his research on Limb Girdle Muscular Dystrophy Type 2C during the event’s short research talks and poster session, which featured a mix of graduate students and postdoctoral fellows across a range of disciplines. At the event’s keynote speech, Meg Ruesch ’98, PhD, a vice president at Pfizer, who studied in the laboratory of Laimonis Laimins, PhD, chair of the Department of Microbiology-Immunology, gave an overview of the various scientific roles behind the development of biologics, and discussed the critical skills scientists need to succeed in any career. Amanda Bayer, a fifth-year graduate student in Chemistry, presented her research at the poster session and short research talks. 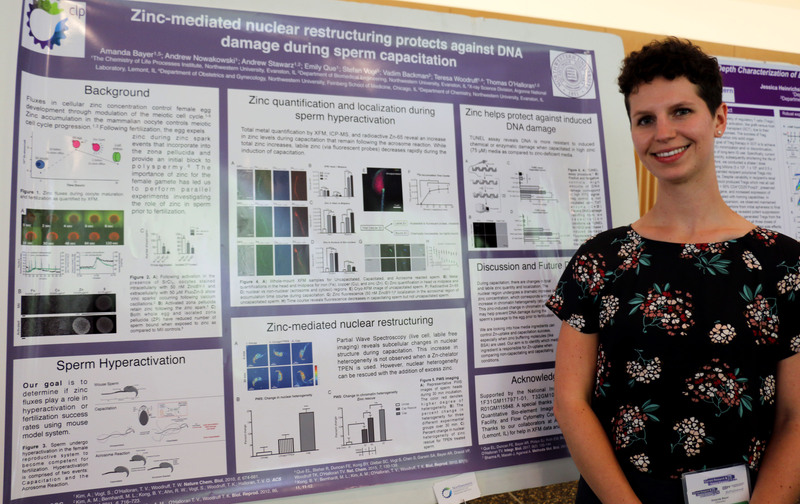 Bayer, who studies how zinc affects male fertility, also presented her research at the symposium. The event also included a viewing party of the afternoon’s solar eclipse, and an evening reception for attendees. The NUPF plans to host similar events in the future that both provide career development and foster community among postdoctoral fellows.